Tibet Times: What do you think are the main hopes and aspirations of the brave Tibetans who set themselves on fire inside Tibet? Lhasang Tsering: Human beings, when faced with desperate situations, either kill others or kill themselves. Those Tibetans who set themselves to fire raised slogans calling for the return of His Holiness the Dalai Lama to Tibet; some raised slogans about freedom in Tibet and there were also some who raised slogans for Tibet’s independence. In all, it is clear that Tibetans inside Tibet are not happy. These desperate actions makes it clear Tibetans are suffering under the brutal Chinese occupation and their intense desire for freedom is also clear. We, the Tibetans living in exile, must respect their aspirations. Particularly, the Tibetan Government-in-Exile must recognize this. Our government must respect the brave Tibetans who sacrificed their precious lives for the cause of Tibet. Tibet Times: What would be the short-term and the ultimate impact on the Tibetan cause of these self-immolations? What is your personal view? Lhasang Tsering: It is a huge loss for the family members and relatives of the brave Tibetan monks and nuns who set themselves on fire. They are no longer alive. However; it depends on us whether their actions will have a positive or negative result for Tibet and the Tibetan people. For example, if you hit others with just a single finger, rather than hurting others, you would be hurting yourself. However; if you hit with a firm, clenched fist with all five fingers joined in unison; it will hurt your opponent. I heard that some members’ in our community are debating whether these self-immolations are acts of violence. I feel really depressed and sad to hear such debates. People who circumambulate Tsuklagkhang and other holy sites kill insects by trampling on them. Can you refer to this as an act of violence? Their motive is spiritual accomplishment. It cannot be violence to sacrifice one’s life for the sake of protecting one’s country and one’s nation and to preserve our religion and culture. The real act of violence is being inflicted by the Chinese who oppress our people and create these desperate situations. Shirking from the responsibility to serve the Tibetan cause and failing to stand up to oppression and injustice is an act of violence and deceit. Tibet Times: How do you define the present status of the Tibetan struggle for independence? Lhasang Tsering: Considering the courage and dedication of Tibetans inside Tibet, the status of our struggle for independence is highly commendable and hopeful. However, the Tibetan Government-in-Exile has rendered our struggle directionless. Whether it is an individual or of a community; or even a nation; one must fulfill three conditions for a movement to succeed. Firstly; the aim of the struggle should be clear. Secondly; one must have the necessary confidence to achieve that goal. Thirdly; one must actively work to achieve that goal. Apart from merely stating that it is for the mutual benefit of Tibetans and Chinese, our present Middle Way Policy does not have clear aims and objectives. We do not have confidence because we fear that China is mighty and powerful. Apart from issuing statements or making speeches about our cause; in reality; in exile we do not have enough people who sincerely care about the Tibetan cause and no one actually leading an active struggle. Tibet Times: Are you satisfied with official campaigns initiated by Kashag and the Tibetan Parliament-in-Exile to highlight the critical situation inside Tibet? 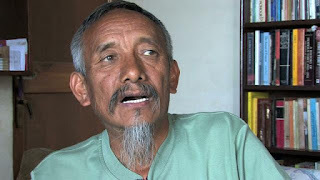 Lhasang Tsering: As I said earlier; besides merely refusing to listen to the voice of the general Tibetan people; the Kashag is doing nothing to resolve the issue of Tibet. Therefore; it is not a question of whether it satisfies me or not. I am left in dejection and hopelessness. The government is an organization to lead people. What the Tibetan Government needs to do is to lead the struggle for freedom. The Tibetan Government-in-Exile, based in Dharamshala, has forgotten our freedom struggle and yet it seems that it perceives itself as running a real government. This is not right. The roof above our heads and the soil under our feet do not belong to us. They all belong to others. Even the general public knows that a ‘mutually beneficial’ solution for resolving the Tibet-China issue is not practical and achievable. Even if it may be achievable, we must know that we don’t have time to wait for long. Thousands of Chinese are migrating into Tibet even at this very moment when I am being interviewed here. Yes; Time is running out on us. Tibet Times: What responsibilities and what kind of movements we Tibetans in exile must initiate considering the critical situation inside Tibet? Could you please share your thoughts? Lhasang Tsering: In exile, non-governmental organizations and ordinary Tibetans are making every possible effort towards our freedom struggle. However, these will not bring real, meaningful result, as they cannot influence the international community. We need a clear plan and a leader who can lead us and unite us all. Without such leadership, it would be like laying thousands of bricks in the wilderness. Such bricks scattered on the desert surface will not result in a house. There are many people who appreciate His Holiness the Dalai Lama’s decision to devolve his political power to an elected leader; but I absolutely do not consider it a positive step. For example; if there is a shepherd who, in the name of taking his sheep to a greener pastureland, herds them here and there, and finally leave the sheep in the middle of a vast desert telling them ‘now the authority is in your hands’, is the shepherd fulfilling his duty? Of course; democracy is important, but it is an internal matter of a free country. Is it worthwhile to argue about the shape and size of the house and the colour of the walls before you have the land to build the house? In my view democracy can wait; but not the struggle for freedom. Tibet Times: All the people who immolated themselves are monks and nuns and we often say that our struggle is for the cause of Tibetan religion and culture, so what in your view are the responsibilities of the Tibetan reincarnated lamas belonging to different religious sects in exile? Lhasang Tsering: I cannot speak about the views of Tibetans inside Tibet, but Tibetans in exile must have various opinions with regard to this matter. Some people are not able to express their views because of their faith and devotion. Personally, I think that I have put my best possible effort in leading movements and nurturing leaders for the cause of Tibet while I was working with Tibetan Youth Congress. What I want to say is that if [in our community] there are people who think there is a spiritual practice that is more precious and sacred than serving the happiness and wellbeing of one’s country and its people; then I request you not to live in the Tibetan community. Please do not take benefits from our community. I cannot accept a spiritual practitioner who seeks to achieve individual enlightenment and who works only for the personal benefit or for the next life without shouldering responsibility for Tibet and the Tibetan people. We Tibetans do not need such spiritual practitioners at this moment. Tibet Times: After His Holiness the Dalai Lama’s devolution of political power to an elected leader, do you think we can see some change in our movement and the nature of our struggle? Lhasang Tsering: His Holiness the Dalai Lama has been the Spiritual and Political head of Tibet for centuries. I cannot say for sure there could be a change in a day or two, or within the next few generations to come. On paper, it can be written that His Holiness the Dalai Lama has devolved his political authority to an elected leader. However; in the hearts and minds of Tibetan people it is only His Holiness the Dalai Lama who will remain as the Spiritual and Secular head of Tibet. When my body and mind separates from each other and when my flesh and blood spills out, even at that moment, my consciousness will regard His Holiness the Dalai Lama as my sole leader. [At this moment, Lhasang la took a pause and shed tears]. Once again I request His Holiness the Dalai Lama to reconsider his decision of devolving political authority when our freedom struggle needs him most because our nation is on the brink of death. The Tibetan people can change their clothes but how can we change our hearts? Tibet Times: Do you see some hope that the Tibetan struggle [for autonomy] will gradually move on to struggle for Rangzen? Lhasang Tsering: I am not a person who relies on empty hopes. If you ask me do I think should the struggle move on to Rangzen; in reality, I would say definitely I do. I was the one who openly expressed that it would be an impractical [solution] when His Holiness the Dalai Lama proposed the Middle Way Approach on 15 June 1987. At that time, there were Tibetans who even threatened to kill me. My children also faced problems in their school because of my position. I still keep the same political stand. I haven’t made the slightest change to it. I believe in truth and justice. I am not a person who only thinks about personal benefits. The Tibetan Government-in-Exile took a wrong position right from the beginning. There is no benefit in changing the driver if one is travelling on the wrong road. No matter how many times you change drivers, if your vehicle is going on the wrong road there is no change. First and foremost the Tibetan Government in Exile must change its course. Tibet Times: What is your view on people who believe that we cannot have dialogues with the Chinese Government or receive international support if the Tibetans opt for Rangzen? Lhasang Tsering: This is absolutely rubbish. They are ignorant about world politics. The policy of a state or nation is driven by its national interest. There is not a single nation in the world that frames their foreign policy by renouncing its own national interest for the sake of other nations. Between 1959 and 1965, the United Nations passed resolutions recognising Tibet’s right to self-determination. This happened when we were advocating Tibet’s independence. However; because of the spread of Communism in USSR and other countries, US and other western allies gave more focus on how to defeat Communism. As a result, Tibetan issue lost limelight then. After renouncing Rangzen as our official policy, we have not had a single nation that came up and extended meaningful support. Presently, as China is becoming more powerful, it naturally affects the interest of many other countries. For their own interests, not out of concern for Tibet, I am sure we will receive support from these countries if we take some clear actions. Isn’t it foolish to complain that one cannot get a sponsor for one’s child without first enrolling the child in school? Tibet Times: Lhasang la, what is your expectation [from] and appeal to the Tibetans inside Tibet, especially Tibetans who set themselves on fire? Lhasang Tsering: First of all, I would like to bend my knees to the ground in prostration before those valiant self-immolating sons and daughters of Tibet. At this present critical moment, we must prepare ourselves for a determined action. Even an old man like me has made preparations since long time back. I registered [the ownership of] my small bookshop and bank account in my wife’s name. We Tibetans must share our happiness and suffering together. Whether the loss of these lives benefits our cause or not will depend on the Tibetan Government-in-Exile and the officials working in the exile Tibetan community. I request our government to come up with a well-planned strategy and to take concrete step for our struggle for freedom if we really think Tibet’s situation is critical and feel solidarity with those brave Tibetans who have already given up their lives by setting themselves ablaze. It is not of much use for ordinary Tibetans to go and protest in front of the Chinese embassy if our government is not willing to lead us from the front. The Tibetan Government-in-Exile must lead the protests and demonstrations for our freedom! NOTE-- This is a translation of the interview in Tibetan published in the Bod kyi Dus Bab, issue 537/Volume 16/Series-32, 20/11/2011. For discrepancies, please consider the Tibetan version as authoritative and final. The interview is translated by Sonam Gyatso, a researcher at the Library of Tibetan Works and Archives. Very true, our Govt. must come up with strategies that are suitable to Tibetans in Tibet the most. The Tibetans inside Tibet are suffering and they can determine the future directions of our land. There are friendly lenders available on the internet that doesn't bother about fico scores from the needy people crcm.tv the people who work to help the disaster torn victims are staff owned by various industries. need fast - join now using our easy two-minute application.